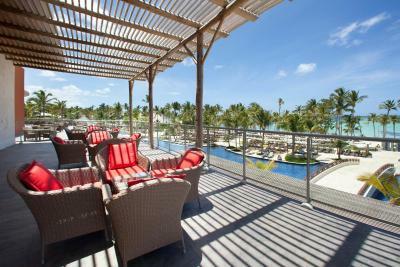 Lock in a great price for Barceló Bávaro Palace All Inclusive - rated 8.6 by recent guests. 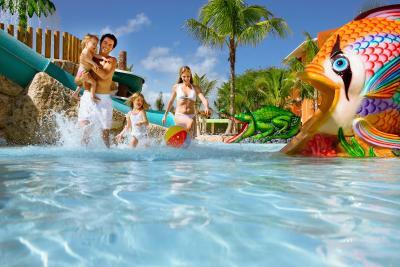 The resort facilities,cleanliness,staff,service and breakfast. The breakfast was phenomenal, I went to the same chef everyday for a delicious omelet. 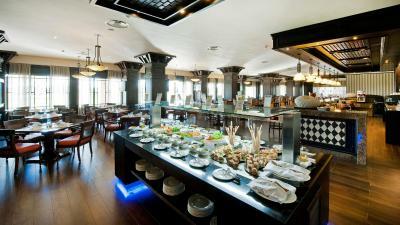 The buffet was awesome and so many different foods to offer for any and every ones dietary needs. I was worried about not having good coffee, but just as everything else, it was great!!! The hotel is very beautiful. Everything looks very new and clean. There are lots of stores. 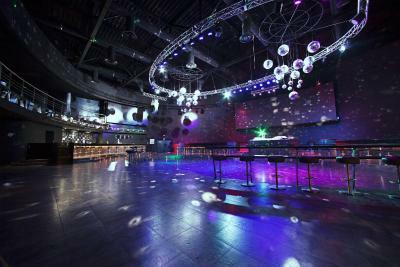 They have a nice cassino and disco. 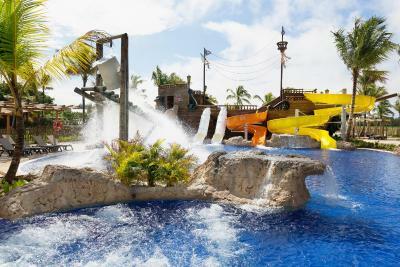 They also have a good kids club and water park. The room is very comfortable and the view - at least from my room - was amazing. The beach is unbelievably beautiful. 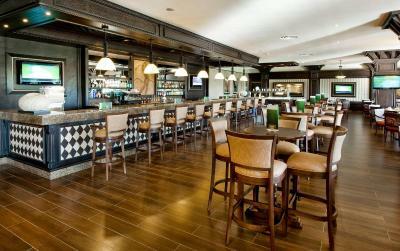 And they have a great pool and a great number of bars (including 1 wet bar). Reservations for food at restaurants were tough to make. There was no prior information given that the restaurants are usually booked out and so reservations should be made ~3 days prior. 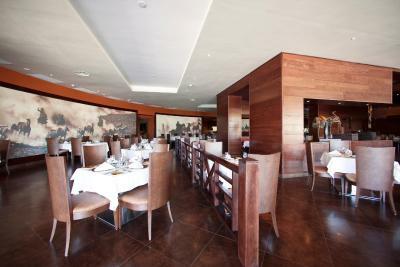 Special restaurants are very nice and diversed - Recommended++. Stuff was very helpful with food allergies - many options were presented to gluten free diet. One of the most beautiful coasts I've ever seen in my life (including windows screen saver). 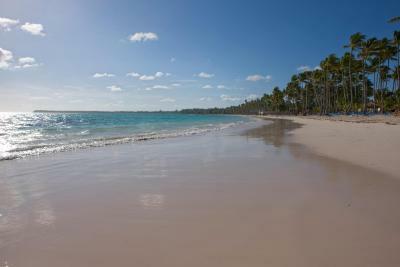 The best beach in Punta Cana in front of the Hotel. Wide range of foods. Lot of activities at the Hotel. 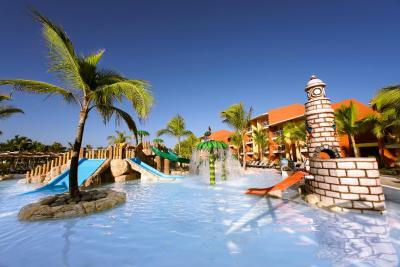 We liked the location, the beach, the pools, everything was really good for the kids. We liked the food, it was tasty. We had the family plan. The 2 rooms were very clean. Beds and pillows are very comfortable and clean. Free mini bar was very much appreciated. Food variety was perfect. Gym was quite good. Night shows were fine. 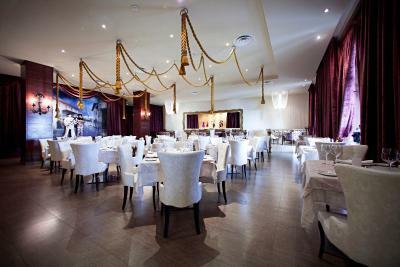 Cleaners, staff and waitress were very helpful. Beach and pool were clean and free water sports were a plus. Excellent place for a vacation! Would like to come again. 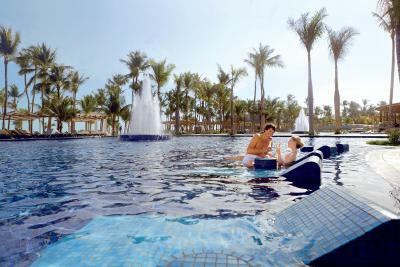 Location- The resort was not too far from the airport. About a 20 minute car ride. Beach- Great private beach. Plenty of lounge chairs and they did a good job cleaning up the seaweed. Never felt crowded Pool- Enough of room for everyone. Again, never felt crowded. Room- We booked the Ocean front Suite. Great size suite with a large walk in closet and a really large balcony. 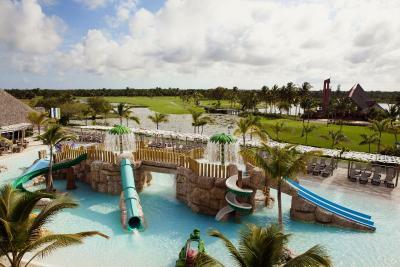 I liked everything about this resort! 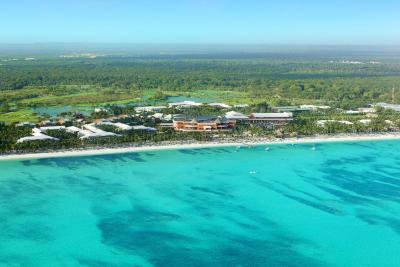 The staff, the options/activities available, the easy access to the beach, and the beauty of the place. I wouldn't hesitate on coming back! 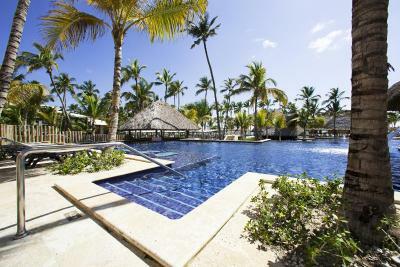 One of our top picks in Punta Cana.Nestled on Bavaro Beach in the Dominican Republic's Punta Cana region, this all-inclusive resort is part of a select 2-hotel resort complex. 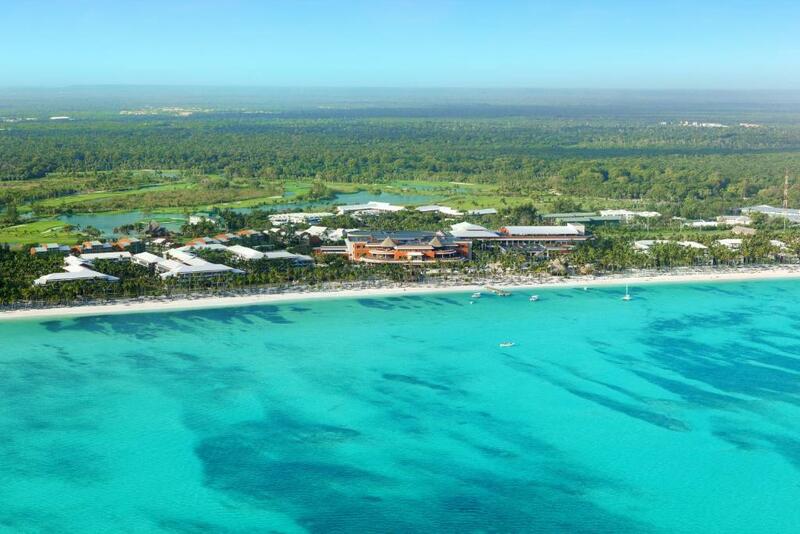 It features 1.2 miles of private beach and a coral reef. 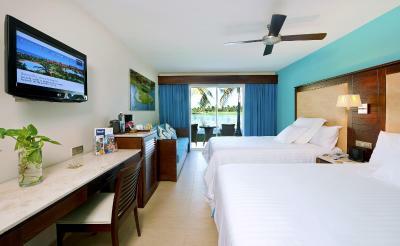 An iPod docking station and a flat-screen TV are included in all rooms at Barcelo Bavaro Palace All Inclusive. 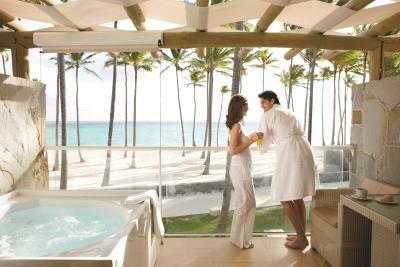 They also include a spa bath, a minibar, and a balcony. 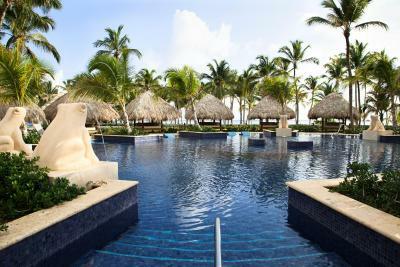 Guests at Barcelo Bavaro Palace All Inclusive can visit the 24-hour casino, the 18-hole golf course, or the world-renowned spa. 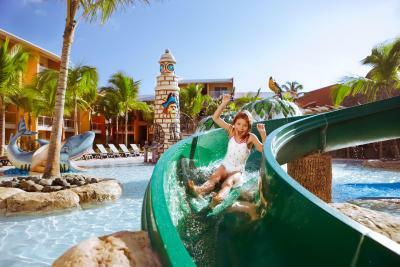 The resort offers a train to transport guests around the property. 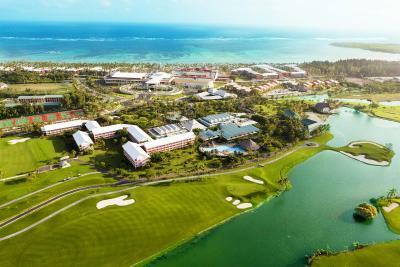 The Barceló Bávaro Palace hotel has been awarded the Green Globe Certification for its sustainable tourism practices for two years. 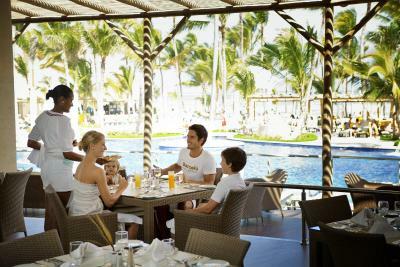 The all-inclusive program at Bavaro Palace includes breakfast, lunch and dinner at one of the 12 restaurants in the complex. 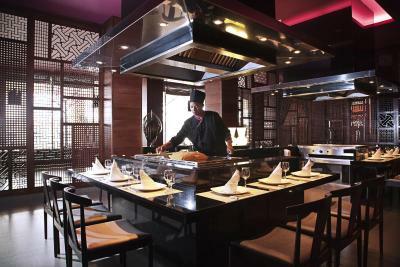 Dining options include Japanese, Italian, French, and Mexican food. 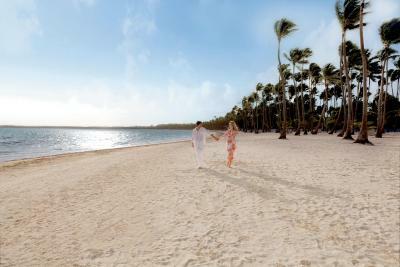 Punta Cana International Airport is 12.5 miles from Barcelo Bavaro Palace All Inclusive. 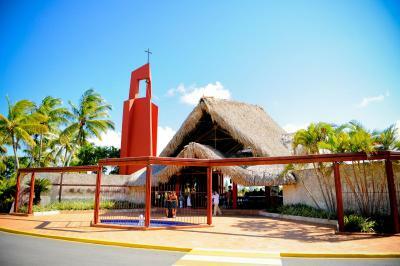 Santo Domingo, a UNESCO World Heritage Site, is 125 miles away. 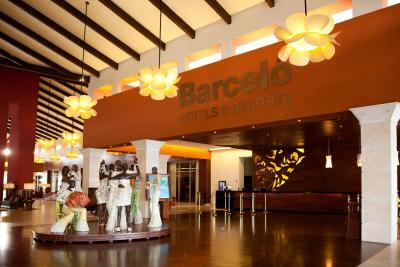 Barceló Bávaro Palace All Inclusive has been welcoming Booking.com guests since 19 Jan 2010. 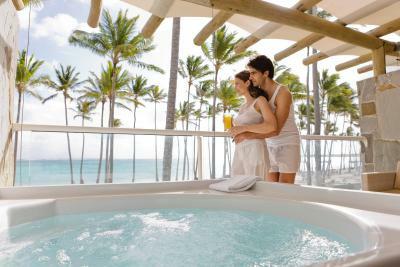 When would you like to stay at Barceló Bávaro Palace All Inclusive? 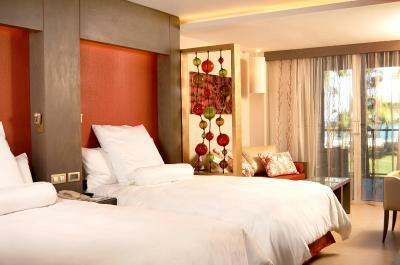 This junior suite has a sofa, air conditioning, an iPod dock and a flat-screen TV. 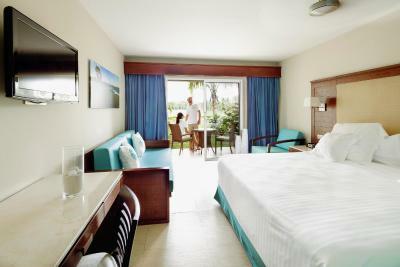 A Minibar and coffee maker are also provided, while the bathroom includes a rain shower, slippers and bathrobes. This spacious family room offers a king bedroom and a balcony or terrace with a hot tub. 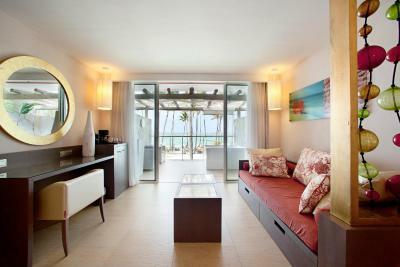 There is also a twin bedroom with a terrace or balcony. 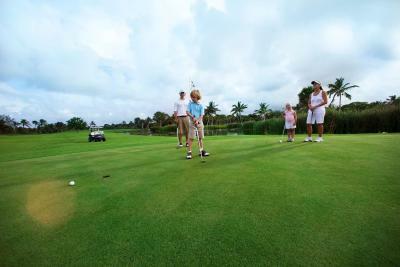 Both bedrooms have garden or golf course views, air conditioning, an iPod dock and a flat-screen TV. Please note that the price is based on 4 adults plus 2 children (up to 12 years old). No additional guest allowed for this rate. 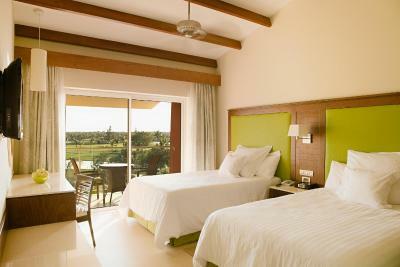 This modern, air-conditioned room offers a balcony with golf course views and easy access to the course. 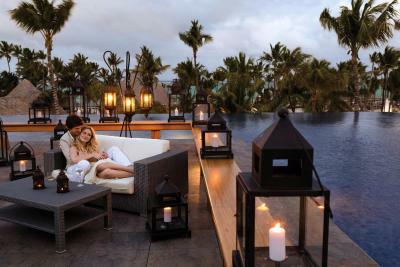 It comes with pillow top beds, a flat-screen TV, fully stocked minibar and a sofa. The private bathroom includes a bathrobe, slippers and a rain-effect shower. This family room has a balcony, bathrobe and iPod dock. 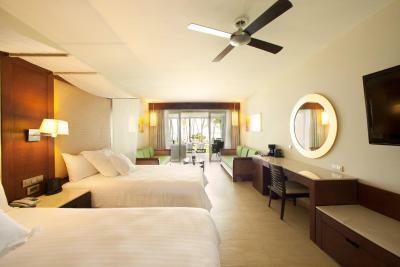 This suite has a sofa, air conditioning, an iPod dock and a flat-screen TV. 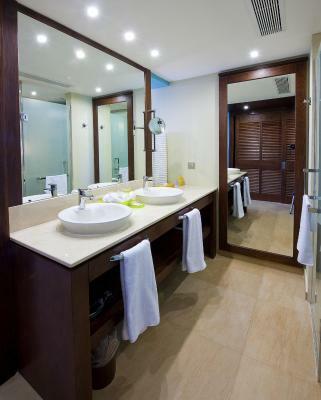 A Minibar and coffee maker are also provided, while the bathroom includes a rain shower, slippers and bathrobes. This suite has a balcony, patio and bathrobe. Please note that the price is based on 3 adults plus 1 child (up to 12 years old). No additional guest allowed for this rate. This family room features a balcony, iPod dock and minibar. Please note that the price is based on 3 adults plus 2 children (up to 12 years old). No additional guest allowed for this rate. This family room features a balcony, minibar and bathrobe. Please note that the price is based on 3 adults plus 3 children (up to 12 years old). No additional guest allowed for this rate. Property surroundings – This neighbourhood is a great choice for travellers interested in sunbathing, excursions and water sports – Check location Excellent location - show map Guests loved walking around the neighbourhood! 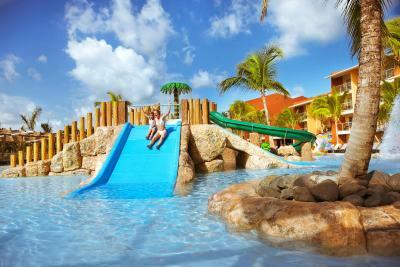 House rules Barceló Bávaro Palace All Inclusive takes special requests - add in the next step! 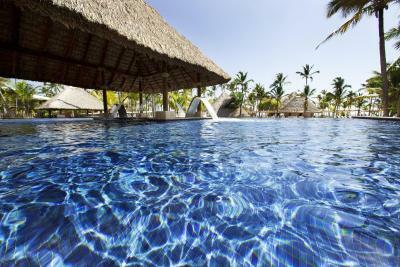 Barceló Bávaro Palace All Inclusive accepts these cards and reserves the right to temporarily hold an amount prior to arrival. Please note that transfers are not included in the price, but can be arranged on request at an extra cost. 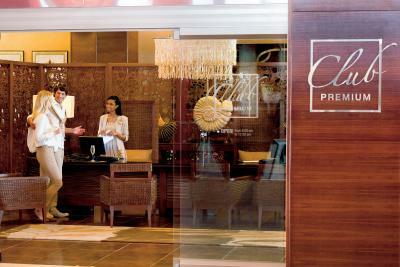 To arrange transfers, please contact the hotel in advance using the contact details found on your booking confirmation. Please note that the use of convention centre, meeting rooms and MICE Events are charged separately. Please note that EUR 500 notes are not accepted at the property.